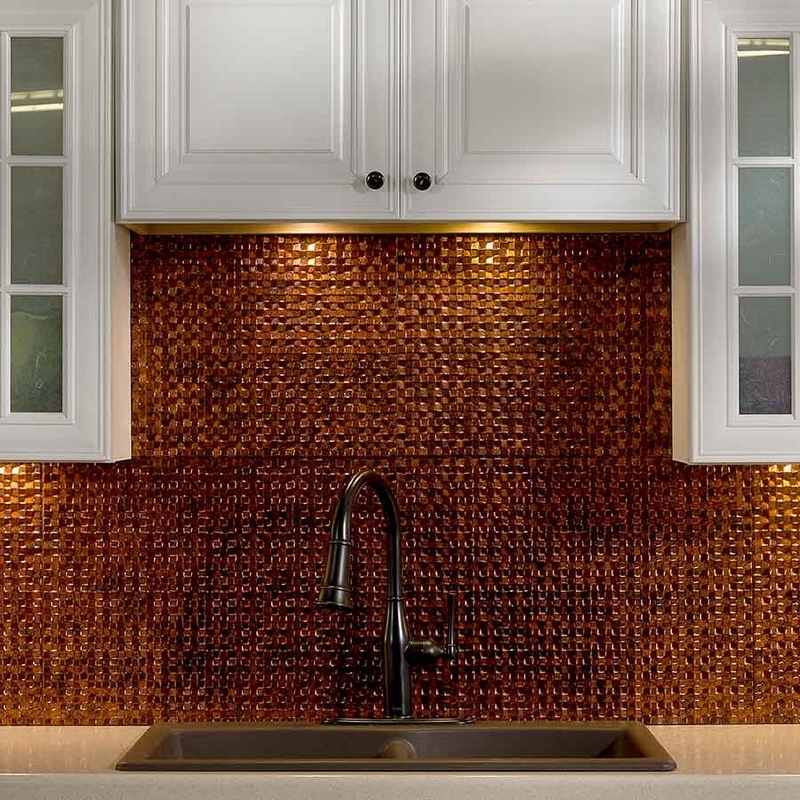 In a predominantly wood and marble kitchen, beside the wood framed fridge is a marble counter that boast a marvelous backsplash wall of literally, pennies, that add to the glittering feel to the space.Mounted horizontally on the copper wall are three, lighted wooden planks that matched the frame on the fridge. The planks serve as shelving for decorations such as antique tea pots and ceramics. In a peach colored kitchen, with wood cupboards and marble counter tops is a unique copper sheeting backsplash situated just above the stove. 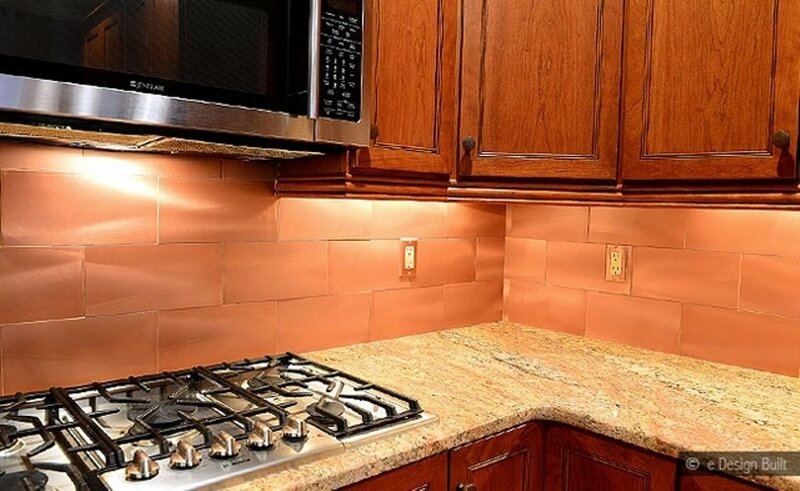 That backsplash is used to hang copper pots and pans that they may be easily available by the shiny new stove. Contrast to the white paneling and black marble counter tops, the sparkling copper tiled backsplash wall that encompasses the area by the sick to behind the shiny stove makes the whole kitchen just pop.Not to mention that the copper tiled backsplash wall complements any design decoration such as ceramics like teapot sets or vases for flowers and what not. It is already established that light tones such as white and peach goes well with copper but imagine if the copper tiles have intricate pattern designs hammered on them.The design takes an individual back to those rustic Spanish designed kitchens where they make use of colorful pattern painted tiles.Only this time instead of ceramic, the tiles in question are copper with hammered designs. Add to that dark metal faucet and an individual wouldn't want to leave their kitchen. 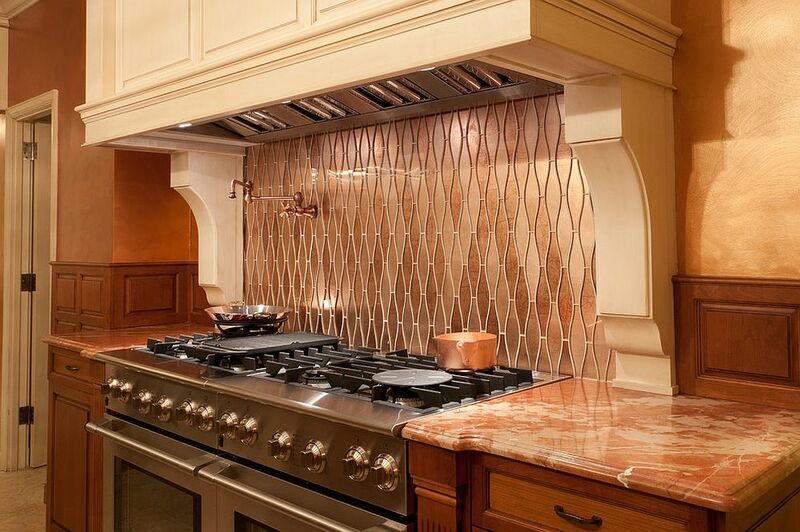 How about a copper tiled backsplash that greatly complements wood grain storages and panels, black tiles and counter tops and a copper washed stove top ventilation shaft? The design is classic but it is like the negative film of a photograph given that the dark colors of the tiles of the walls and floors and the wood grain of the storages. Over all, the copper shade tied with the dark tone gives the kitchen a feeling of calmness, like an individual can discuss something of importance with another individual while cooking perhaps, supper. A shabby chic kitchen with white painted storage, an old-style oven and linoleum tiles of different shades of blue is the perfect accompaniment to a square copper tiled backsplash.That reddish hue of the copper backsplash against the white paint of the cupboards and the kitchen appliances, meaning the oven and the refrigerator, is stunning.The space above the cupboards is simply a the perfect backdrop to display some antique ceramics, such as plates, and cutleries. The single copper sheet backsplash against the dark and light colored wood grain of the cupboards and the counters in the contemporary kitchen would give the kitchen area a less daunting feel.The kitchen's simple and elegant design lets the hues speak to the eyes of anyone who prepares meals in the area. A Mediterranean kitchen with dark washed kitchen storage trimmed with gold-ish metal and cream walls nicely complements the reddish copper backsplash behind the stove under the dark washed, metal trimmed ventilation shaft.Attached to the said backsplash is one shelving where it serves as storage for copper pots and hooks to be able to hang utensils such as stirring spoons or metal spatulas. A shiny single sheet copper backsplash on the wall behind the shiny stove is the perfect accompaniment to white painted cupboards, a copper worktop island and wood grain floors.The modern traditional design coupled with the white paint and the reddish hue of the backsplash and the copper worktop of the island gives the entire area a homey feel.An individual can clearly see themselves cooking for hours in the space. A small but beautiful modern kitchen is home to a shiny custom copper backsplash above the shiny stove and below the stove top ventilation shafts with a cream hue.Complimenting that combination are rose colored marble counter tops and rose painted walls that go together with the copper backsplash.The final piece of the design that ties it all together are the wood grain cupboards and storages and wood grain wall panels.